What is the Solo and Ensemble Contest? 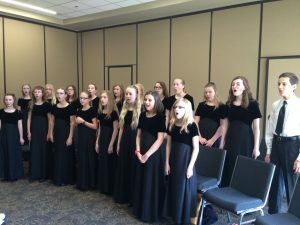 It is an event organized by Central Oklahoma Homeschool Choirs that is open to all Oklahoma students ages 8 to 18. The goal of the Oklahoma Homeschool Solo and Ensemble Contest is to provide an opportunity for students of any educational background to receive personal feedback via a highly-qualified solo and ensemble adjudicator. In other words, this is NOT an OSSAA sanctioned event. While the schedule is subject to change, participants of the Solo and Ensemble Contest can expect to be to be assigned an adjudication time somewhere between 9:00 a.m. and 2:00 p.m.
Where will the Solo and Ensemble Contest take place? Every year we select the best of the best when it comes to adjudicators, including college professors and/or current performers in the state. What is the cost of the Solo and Ensemble Contest? What are the guidelines of the Solo and Ensemble Contest? All performances are to be accompanied by a pianist unless the music indicates otherwise. Registrants will be responsible for providing their own accompanist. Vocal literature should reflect standard solo and ensemble repertoire. A new category for Music Theater selections has been added this year. Jazz, Pop, and Country selections are not appropriate and are unacceptable for this festival. ONLY ORIGINAL MUSIC is permitted. If music is on order and didn’t arrive in a timely manner, have the music supplier send you a copy of your invoice. If music is permanently out-of-print, please have the publisher send you a letter of permission to use copied music specifically for this event. Adjudicators have the right and responsibility to not rate a performance when copied music is given to them. Students should write his/her name inside the front cover the music so that it may be easily returned. All selections should be performed by memory. Failure to do so will automatically lower the participant’s score by one rating. Participants may sing one musical selection per entry. While participants may prepare a piece of any length, a judge reserves the right to ask the participant(s) to discontinue should the performance last longer than 5 minutes due to time restraints. For such, no rating deduction will occur. All performing ensemble members and accompanist MUST be listed on the registration form for eligibility and scheduling. Participants should be prompt to their performance location as the Solo and Ensemble Contest is on a tight schedule; they may not have an opportunity to perform if tardy. All registrations for either solo or ensemble must be received and/or postmarked three weeks prior to the event. Payment in form of check or money order is accepted until Friday, March 29, 2019. Cash or credit card will not be accepted. All payment should be made out to: Central Oklahoma Homeschool Choirs with “Solo & Ensemble” in the memo line. All fees are non-refundable. When will I know my adjudication time? Be looking for an email with your adjudication time by the Tuesday before the event. If you do not receive more information by this time, please contact Kathy Gossen (admin@centralokhomeschoolchoirs.com or 405-833-6427) for more information.